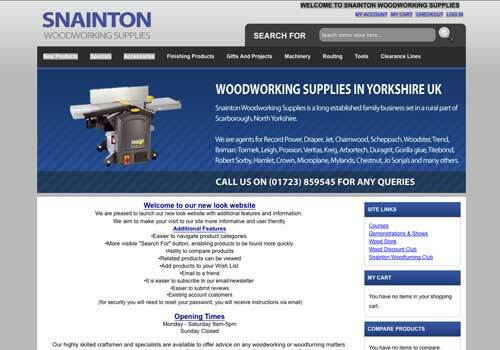 A long established family business set in a rural part of North Yorkshire, Snainton Woodworking Supplies are agents for leading brands in the industry including Record Power, Robert Sorby, Proxxon, Scheppach, Trend, BriMarc, Gorilla Glue and Arbortech. They have just launched their new look website which boasts a variety of additional features and information for the viewer. The new website aims to be more informative and user friendly, as well as easier to navigate the different sections it includes. The sections you can choose from include new products, special offers, accessories, machinery and woodworking accessories, all of which are very easy to browse. There is also a comprehensive 'search' facility which allows you to look for a specific brand or product name, thus saving you a great deal of time. There is also a 'wish list' facility and you can add products to this, and also email a specific product image or description to a friend - perfect as Christmas is coming up! You can also subscribe to the newsletter via the website and submit product reviews. Users can also set up their own account which is very handy for security reasons. Go ahead and browse the new look website yourself. Have fun!